On any Saturday at the Hollywood Farmers Market when you want a healthy “pick me up” or a heavenly treat for your taste buds, stop by Sacred Summit! There, Dario or Zach are on hand to help you sample any of the delectable, small-batch chocolates and truffles or Jun (a kombucha-like elixir). And on occasion, gluten-free cookies made with real maple sugar. Dario, a Portland native and the co-creator of Sacred Summit, had worked as a server, a cook, and an art vendor, where he learned essential business skills. But he wanted to create environmentally sustainable and nutritious foods that needed to delight the soul, contribute to people’s health, generate opportunities for other people, and help other countries’ economies. 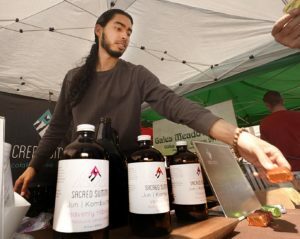 Inspired by a friend from Eugene, Oregon who had been making chocolate and kombucha, Dario started researching what it would take to have a similar business in Portland. 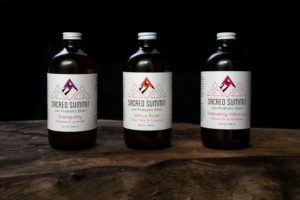 After a year and a half of intense research, development, and building up inventory, Sacred Summit became a reality in May 2015. The name Sacred Summit came to Dario from a couple of personal ideals. Sacred because it is food which nourishes and sustains life. Summit because as a former snowboarder, the goal was always to get to the summit, and Summit became a metaphor for climbing any mountain, overcoming obstacles, and living life fully through the highest aspiration. 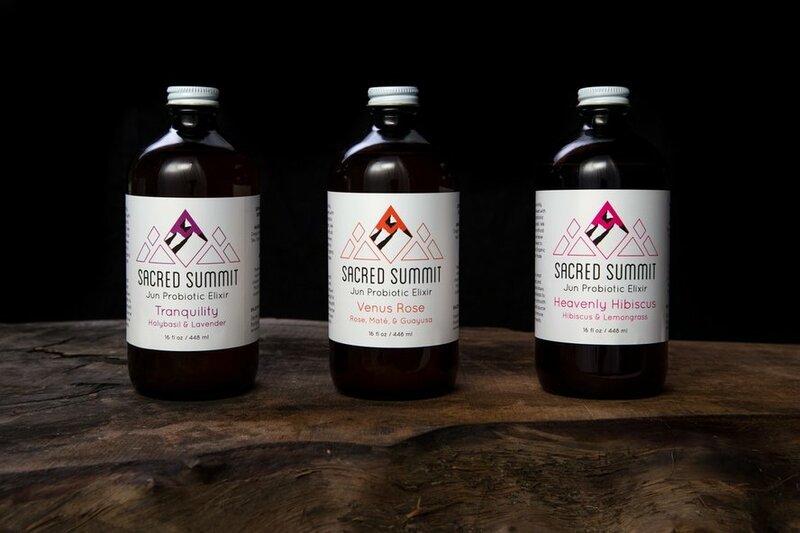 Sacred Summit is the culmination of vision, hard work, and achieving a dream using the highest quality, organic ingredients sourced through fair trade cooperatives and vendors. The magic happens in a cooperative kitchen space in Southeast Portland. 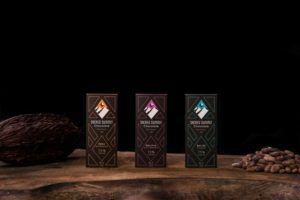 Sacred Summit specializes in single-origin chocolate and uses only 2 ingredients, organic cacao, and organic maple sugar in their chocolate bars. 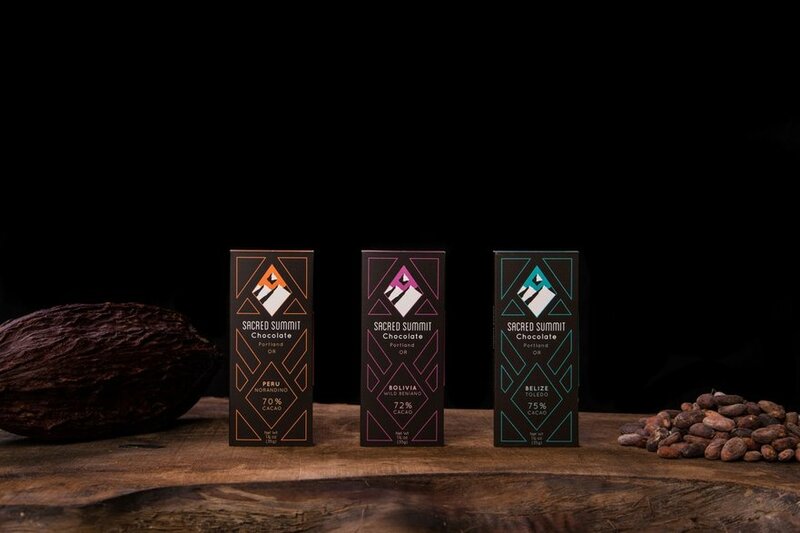 Produced in small batches, the bean-to-bar chocolates are made with the finest quality, fairly-traded, and ethically-sourced cacao. Based on the region the cacao is grown in, the flavors range from smooth and silky to full-bodied and rich. Like fine wine or cheeses, the fruitiness, nuttiness, astringency, bitterness, and aromatic qualities unfold with each bite. The delectable organic truffles are a market favorite ─ delicious AND healthy. Using a base of raw Ecuadorian cacao, coconut oil, and Oregon honey allows the nutritional properties to remain intact during the heating process ─ assuring the full benefits of the ingredients. Sacred Summit truffles are nut-free, dairy-free, gluten-free, and free of refined sugars, making them a wonderful treat for the whole family. Jun is a kombucha-like drink made from green tea rather than black tea, and honey rather than cane sugar. Like kombucha it is a fermented, naturally effervescent beverage ─ providing a great source of probiotic. All flavors are made with purified water, raw Oregon honey, jasmine green tea, and lactobacillus probiotic cultures. Stop by the Sacred Summit booth at the Hollywood Farmers Market to sample and take home any of the delightful, handmade chocolates or Jun for a quick pick-me-up. Visit their website http://www.sacred-summit.com/ for retail locations and other farmers markets.